We are so in love with this time of year because everywhere you look wildflowers are popping up to say hello. Vendors at the farmer’s market are starting to bring in flowers. Nurseries have fantastic offerings too. But what rains on my flowery parade is when I ask a flower vendor if they know if a particular plant or flower is toxic to cats and they say they have no idea. Nor do they seem to care! Don’t you agree that if they are selling something they should know such details? I keep copies of this list of toxic flowering plants in my car to enlighten stores and other vendors. Here’s the Cat Faeries list of flowers to avoid in Spring along with what will happen to a cat if one is eaten, or the water they sit in is licked. Copy and paste, then distribute! Lilies – All of them, any time of the year, absolutely all of them can kill your cat! Seizures are just the start! Flower, bulb and pollen are deadly. At our house about the only flowers you’ll ever see are fair trade/organically grown roses. You cannot go wrong with a nice bunch of organic roses – they cannot make a cat sick. But you do need to make sure that they are organic and fair trade – many roses are sprayed heavily with pesticides and are shipped to the US from other countries which is so cray-cray to us when they grow well here. Demand locally grown pesticide free roses. Besides roses we love Lilacs, another safe flower. Sadly their season is short so enjoy them while you can. Other cat-safe flowers include: African violets, Alyssum, Calendula, Bachelor’s Buttons, Begonias, Columbine, Coneflowers, Gerber Daisies, Hollyhocks, Impatiens, Nasturtium, Orchids, Petunias, Snapdragons, Sunflowers, Violets, and Zinnias. If you are like me and love flowering herbs these make very sweet little rustic bouquets, darling in Mason jars: Basil, Bee Balm, Cilantro or Coriander, Chamomile, Lavender, Lemon Balm, Lovage, all of the Mints, Oregano, Rosemary, Sage, Tarragon, Thyme. Accustom your cat to a carrier and to traveling in the car. If your veterinarian doesn’t already have your cat’s medical record on file, bring it with you or have your previous veterinary hospital send or fax the records. Also bring your own notes on your cat’s health and medical history. Don’t send your cat with a person who doesn’t have the information the vet will need to help your cat – or if you must do this, thoroughly document your cat’s current condition on paper and make sure you’re available by phone to answer questions that may come up. Unless children can sit quietly without distracting you or interfering with your veterinary team’s ability to examine or treat your cat or talk to you about your cat, consider leaving your children with a babysitter while you take your cat to the veterinarian. Know what medications your cat is receiving (including supplements), as well as how much, how often and how long it is given. Better yet, bring them with you. Don’t be shy about sharing your observations and concerns with your veterinarian – after all, you know your cat better than anyone else does. Ask questions. Ask until you understand the answers. Often vets forget that we don’t have a medical degree. Take notes! Don’t expect to remember everything. While you are taking your notes, you may think of additional questions which you should write down and ask before you leave. Ask for handouts and brochures. Ask if there are reputable online sources of information about your cat’s condition. Follow your veterinarian’s recommendations. They’re given for one very important reason – to keep your cat healthy. Arrange for a follow phone call to review how the cat is doing. And our Lucky 13 thing to do: Check the name or names of medication. Check the dosage and instructions on the bottle/s of medication and compare them to what the veterinarian wrote down. Show it to the office manager to verify. Mistakes can happen and in the case of drugs – they can be fatal. Never take anything for granted, a cat-parent cannot be too fussy! Two weeks ago, we told you that you can brush your cat with a toothbrush when applying Convivial House Cat or a few drops of one of our flower essences. The reason is that the bristles mimic the feel of a cat mother’s sandpapery tongue with the familiar sensation they loved as kittens, which is still very soothing to adult cats. We feel this maternal sensation benefits the usage of our products from the loving touch of something bristly like a toothbrush, and we just learned that a cleaned/bleached mascara wand has the same feel and purpose! And because we are zero-wasters (or try to be!) 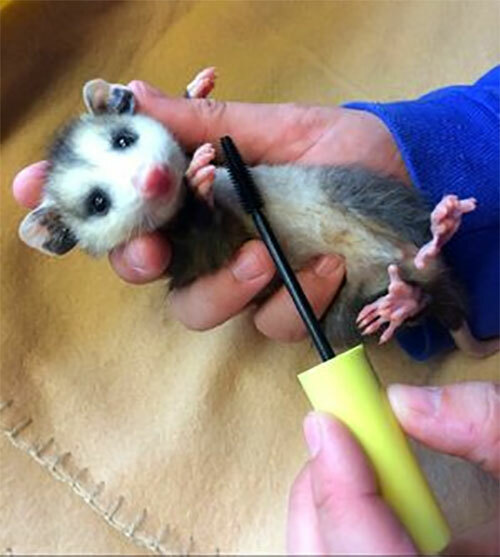 and hope you are too we knew you’d be excited to know that your old mascara wands not only have benefits for your cat, but you can also be a wildlife hero! 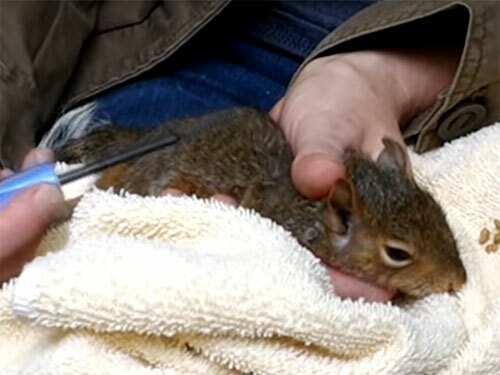 Wildlife rescue organizations and rehabilitation professionals use them to remove all sort of icky things like oil on a bird’s feathers or fur after a spill, mites, fly eggs and larvae. They love mascara wands for their small size and that the bristles are so close together. And yes, you can follow their lead and use one to remove similar debris from your cat’s fur. Always wash and bleach the mascara wand when it’s time to get a new tube and send the old wand onto its new home! By the way for the health of your eyes, mascara should be discarded every 2 months, 3 months at the most. Save one or two old mascara wands for your own use and mail the rest after you’ve washed and bleached them. How much bleach? Dr. Mason, also known as Auntie Joy tells us the Clorox bleach needs to be diluted with water. This is how her clinic dilutes it for dogs to prevent Parvo: “In the clinic we recommend that people use a 4:1 dilution of water to Clorox if they want to put a foot bath at their front door to prevent Parvo virus from being spread if there is an outbreak in their neighborhood “ The same dilution would be good for the mascara wand. How to clean a mascara wand without making a huge mess! As you might imagine cleaning off a mascara wand is messy! Auntie Cat Faerie using her Virgo logic came up with this easy method! While she hates throwing things away she hates wasting water more so grab some paper towels. While wearing disposable gloves use your paper towels to wipe off as much mascara as you can, otherwise your hands will be very stained. Using a few damp Qtips scoop out as much mascara as you can from where the wand in attached to the cap. An empty narrow glass jam jar the height of your wand with 1 part Clorox and 4 parts water will allow the wand to stand up straight making removing it easy for you. The bleach will most likely remove any traces of mascara that you couldn’t rub off. Rinse in hot water when finished. Mascara wands can also “go where no brush has gone before” for use around the house in any small crevice where dust and gunk settles. Use one on your sewing machine, your computer keyboard, clean jewelry, clearing the lint catcher in your blow-dryer, even the little oxygenating vent in your faucet tap where the water passes through and gunk can build up (let the floodgates open!). They also gently clean off mushrooms! Weather.com is predicting the “Coldest Arctic Outbreak in at Least Two Decades” will hit the Midwest this week, so we wanted to send out this special edition of the Cat Faeries Newsletter because saving the lives of feral/community cats is critical. We did not include our usual photos of customer’s cats (which this month are calicos and torties) as we wanted to get this important message out right away. We’ll send another newsletter later this week with our usual “cute video” and the cat of the month… plus a sale! We asked A Friend of Cat Faeries who is a good researcher and a great friend to all cats including the ferals and community cats what she does in her super cold upper Mid West Winters. Here’s her report on REALLY easy to make shelters with lots of links to which she’s made her comments. She also gives us her own personal instructions which have been tested and perfected over many years. An outdoor cat shelter can be easily made in several ways. What works very well are those knee-high Rubbermaid tubs with the snap on lids or a large Styrofoam cooler. I’ve done both. The Rubbermaid tubs do weather over time, becoming brittle after 3 years or so, but they’re very sturdy and cats do use them easily. Rubbermaid Tub – I use the Rubbermaid Roughneck 25 gallon storage container. They cost around $6 each, generally come in blue or gray and are knee high. You can find them your local hardware store or a big box store. You will need to cut a 4 or 5” circle into the side of the tub about 4” above ground level, to avoid splash back with rain or snow burying the entrance. You can cut with a box cutter, but make sure you don’t have the blade slide unexpectedly, be careful. The plastic is fairly thick. I used a saw to do it. Use a file to smooth down the rough edges as much as you can. Find a cardboard box that will fit into the Rubbermaid bin snugly, set it inside with open end up and put a pad of folded newspapers under the cardboard box. Draw a circle on I where the side meets the hole you just cut. Cut out the circle on the cardboard. Slide more folded newspapers in around the box on three sides which provides excellent insulation. You can use straw instead of newspapers if you have it. Inside the cardboard box put a layer of straw or a folded blanket. Straw is usually recommended but I’ve had cats pee in it and it’s easy to remove and start over – if there is urine present, they don’t want to use the shelter afterwards. If you use a folded/rumpled blanket inside, you’ll need to check it once a week to make sure moisture wasn’t tracked in and cause the blanket to freeze. The blanket will need to be washed at least every few weeks as well in fragrance free soap and dried in a dry sheet free drier. I really love the outdoor farm animal heating pads that can be plugged into an outdoor outlet or garage outlet. They cost in the range of $40 from a farm store and has worked fine for 5 years now. It’s only plugged in during winter but left inside the shelter year-round. It has a fleece covering on it which definitely needs to be washed every two months or so. To allow for the cord to be used, you’ll need to cut a 1 ½” wide hole at the bottom of the bin and cardboard box to feed the electrical cord through. The wattage used by the heating pad is minimal, it never overheats and it provides a lot of warmth for the cat WITHOUT requiring the use of straw or a blanket in the box. In fact, the instructions on the pad is that it not be covered by anything or have anything other than a bare surface under it. If the cardboard box has flaps on the top, fold them closed and add more newspapers on top. If there are no flaps, set a piece of cardboard over the top and add the newspapers. Snap the Rubbermaid lid back on and set a brick or something weighty on top to avoid wind from lifting the lid off. Placement of the shelter should be near a garage or under bushes with the hole facing away from the main wind direction. One too close to a door of a house may spook the cats so the garage area is often going to feel safer for the cats. I’ve noticed that the shelter near my side door isn’t used anywhere near as often as the one in the back. Slant sided coolers have less interior space so try to find one that’s vertical sided. Look for coolers that are 16 – 20 inches tall. When I cut a small hole in mine, I first made it 3” wide but didn’t think a cat could get into that. My Siamese didn’t even hesitate, she took one look and snaked into it in three seconds. Given that she’s a small cat and the outdoor ones are generally larger, I made the hole a bit larger, at 4 ½” and that works fine for any adult cat I’ve seen outside. If you use this type for a shelter, the Styrofoam is very easily cut with a steak knife. Place the hole above ground level. A 4 or 5” round hole is easily sawed in and large enough for an adult cat (but not a raccoon and generally not an adult opossum to get in). I made mine wider by taking two of the knee-high coolers and cutting out one side of each and duct taping them together to make an extended shelter. The lids were duct taped too, and to avoid any rain seeping into the shelter from the top I set a wide plastic sheet over it and anchored it down with two bricks. Coolers are generally white, which blends well with white siding or white walls on structures. You can put a tarp over the container if you wish, also, for coverage, anchoring the sides down with a weight of some sort. You won’t need to use a cardboard box inside these because Styrofoam is an excellent insulator by itself. Adding a heating pad, blanket or straw inside is going to work just fine. Make sure to place the opening AWAY from the major wind direction. For a cat to feel even safer, a second hole can be cut for a quick exit, but I’ve found that heat doesn’t stay in the shelter as well when you do that UNLESS you hang a towel over that second hole, attaching it to the outside of the shelter. If it’s inside it’s not going to stay in place, so outside is the only way. It can be glued or have a weight on it, but it should be done in such a way as to keep the wind from blowing it off kilter. You don’t want wind to howl through from hole to hole, that reduces the ability of the cat to stay warm inside. My Rubbermaid shelter lasted 3 years before the plastic cracked due to weathering and I had to replace it. My Styrofoam shelter has been in use for almost 7 years with no damage. Humane society Rubbermaid bins using a Styrofoam box inside instead of cardboard. One using TWO Rubbermaid bins, nestled together. Styrofoam shelter raised up on wood chocks to avoid rain splash back. Styrofoam shelter (hole is TOO big on the left one, right one should not have the cover on the bottom, it can shift off its foundation. From the UK which also discusses hedgehogs! Fresh snow is helpful as it shows fresh paw prints, so you know if a cat came in or out for shelter. It also tells you if they are not using it which would indicate something inside needs cleaning. Look for urine, feces and vomit. If you find feces that do not resemble a cat’s it could be from an Opossum. The hole is usually too small for a raccoon. Newton’s Purrspective: Climate Change – We cannot pussyfoot around any longer! Sir Isaac Newton is our Feline Editor At Large (just how large, he’s not saying) who writes very brainy and very well researched articles for us. 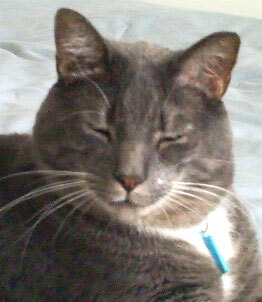 Newton lives in the North East and is fond of storms, our catnip toys, a soft bed, sunbeams, and naps. He has an ongoing email flirtation with our Daphne. This is his current, and as always, very well done article. If you are a cat who lives indoors you have probably not considered how climate change could affect you. On those days when it is too hot or rainy to relax in a CATtio you can retreat to a cozy climate-controlled environment provided by your humans. That is all well and good, but I have something important to say. I know it is difficult, but we cats must start thinking outside our cardboard boxes! It is high time we speak out about important life-threatening environmental concerns. For example, have you considered how climate change is affecting catnip in its natural environment? Ah ha! I see I’ve gotten your attention! Cat Faeries Catnip is ethically wildcrafted by our beloved Cat Toy Elves. This means they find it growing in open wild spaces and harvest it in a sustainable manner where some plants are left to go to seed to ensure a healthy new crop the next year. Recently we asked the Cat Toy Elves if they had noticed any changes in the wild catnip crops over the past few years. I am sad to say the news was disheartening, to say the least. They saw two major problems: 1) destruction of open space to build silly things like condos and 2) extreme weather changes causing conditions that make it difficult for Catnip to grow. Remember, this is Wild Catnip. It occurs naturally and does not rely on fertilizer, irrigation or the controlled environment of a greenhouse. Unusually heavy winter rains may rot the seeds, or simply wash them into areas where they cannot germinate and grow. Searing heat and drought in summer burn up the leaves, buds and stems giving us less to harvest, and eventually killing the plants. Of course, we all know dead plants produce no seeds. The Elves fear a Wild Catnip shortage as early as late spring 2019! Getting your humans to recycle and walk to work or for errands is a start. But scientists say this is simply not enough. Our poor abused planet cannot take much more – in fact they are giving us and it 12 years before things get irreversibly and life threateningly worse. Cats may have nine lives, but our planet does not! Perhaps you haven’t noticed, but sea levels are already rising. Do you read the news? The recent severe rain and drought events have been tied to climate change. What can be done? People need to do their part by driving less and refusing to eat processed food and factory farmed meats. Organic food may cost a little more, but it tastes better and is much healthier! Refuse to buy products from China – consider the massive amount of fossil fuel it takes to ship them here as well as the atrocious labor and environmental policies of that country. Have you ever looked at photos of the air pollution in Beijing? That foul toxic air doesn’t just stay there – it blows all over the globe. I have never been in a big box store, but people tell me they are filled with very strange smells that would certainly irritate a cat’s delicate nostrils. These smells are the result of toxic chemicals impregnated in clothing and all soft goods (e.g. sheets and towels). These chemicals not only pollute our air, but also our water supply when these goods are washed. Most important: Get Your Humans To VOTE. Make sure they refuse to vote for anyone who is not actively trying to reverse climate change and/or endorse renewable energy. No exceptions. Click on this link then forward it to 50 human friends and acquaintances. Knowledge is power and I know that your people are caring and will pounce into action. Your catnip depends upon it! This year Cat Faeries will be joining 1% For the Planet.